From culture to science to comedy, there is no better way to enjoy any kind of show other than from podcasts. With the continuing releases every year, you can get to learn new skills or better still enrich your creativity to the next level. We have summed up the best podcasts 2018 to enable you to learn any skills you need in just under an hour or so. Since there is no stop to technological advances, be sure to check in for more this year as well even as you continue listening to the currently trending. Curiosity killed the cat is a well-known phrase that is commonly used. If you are not curious, how then will you learn and even perfect yourself? Roman Mars will make you understand about almost anything on this best Spotify podcast, 99% Invisible. Listen to this and get answers to all the weird and life’s greatest queries. Furthermore, learn about things that are happening far and wide in a single show. This is a weekly show that revolves around journalism and all that pertains to this career. Listen to this podcast and know how journalists actually get leads for some of the wonderful stories they tell to their audiences. The Tip Off is actually one of the best podcasts on Spotify, specifically enlightening you on about the secrets and detective work behind closed doors of journalism. You will surely love to know what these great men and women go through just to bring you that long-awaited news. Get insights into this documentary podcast, hosted by Medeleine Baran. It is all about investigations into the abduction of a young boy, Jacob, without possible answers. Even though it was purported that there were direct leads that could bring the culprits into the limelight nothing much was achieved. You’ll be left with more questions than answers as to why the law enforcers kept on ignoring other suspects, only to go after one man for over 20 years. This is quite an inspirational podcast show that will automatically propel the energy within you. Lewis Howes knows how best to keep you glued till the end. Furthermore, his main aim is to show you by example. His show features successful stories from known influencers, that is why he has hosted people like Steve Aoki, Maria Shriver and many more. Learn about how to live a fulfilling life and the driving force behind it. You definitely wouldn’t want to miss out on this Spotify podcast that dwells on culture and politics. With only 30 minutes each week, BBC Radio 4 manages to discuss some of the pressing issues that touch everyone’s life. Be it Science, economics or culture, Analysis got you covered. It dwells on episodes on democracies for a better nation, economic crash and others like political debates. Money related issues are complicated that sometimes most people lose interest in it. Planet Money will turn your boredom into an exciting experience. It actually explains all that revolves around the economy in the most creative manner. It will enlighten you on what is happening in the market and other after sought intricacies for a better you. So, if you want to learn about B2B, supply chain, entrepreneurship, you now know where to turn to. It could be very far from best comedy podcasts but it amuses. If you don’t have a relationship with the internet, then you are behind the current age. The world is actually turning into a marketplace with the technological trend. Control Alt and Delete brings much focus to the web, revolving around the internet and online issues. Get to know more about Emma Gannon experiences online with insights on to her work as a media editor. It also focuses on women and the internet and how to manage your online platforms and successful woman. Learn about stories from American history in the most thrilling manner. This Spotify podcast will dive you right into the middle of a fun-filled history lesson. With Reynolds as the listener, he always has no clue on the topic beforehand. This is the cornerstone of mockery from Anthony, the reader of the stories. Besides being funny, this show will teach you interesting topics from well-known histories from America. Due to the weight it carries, it emerges among the best podcasts on Spotify 2018. Tim Ferriss speaks from experience. Being a renowned author of ‘The 40Hour Workweek’, he has actually mastered the art of money making. This business podcast has brought along some of the most successful businessmen and women from Drew Houston, Reid Hoffman, and others. Learn about their routines and what kind of tools you need to be that successful man or woman and range among the world-class performers. Have you ever wondered what goes on behind bars? Perhaps listening to this podcast may help shed some light. It is actually hosted by two prison inmates from San Quentin State Prison. Get into detail with each episode, explaining a different experience of life and what it takes to be behind the barbed wire. Furthermore, inmates share their own life experience and unfolding stories about the two different worlds. The bottom line is that everyone has to get along no matter the environment you are in. Podcasts have become more popular than ever before. They are educational, hilarious and informative altogether. Some of the best Spotify podcasts have gone miles into changing the lives of many people. Whether you need to learn about business, family or the world around you, all you need is 30 minutes or so of your time every week. Furthermore, you will learn from the most experienced guests each time you tune in. At last, if you'd like to download Spotify podcasts to MP3 players for playback, you can getDRmare Spotify Audio Converter for Windows/Mac to help you. 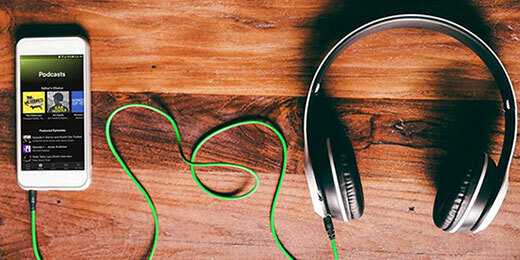 For more info, you can visit: How to Convert Spotify Music to MP3.